If you haven’t seen Phoenix from South Mountain, you’re missing out! 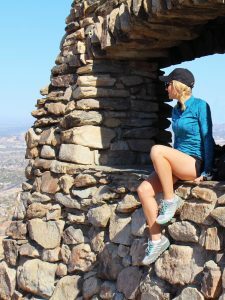 Hiking the Holbert Trail on South Mountain will take you to an Arizona treasure known as Dobbins Lookout. 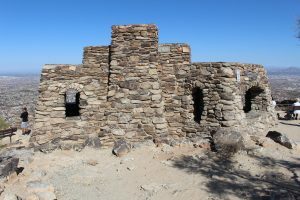 The structure on top was built in the 1930’s and it offers an incredible place to relax and enjoy the highest point you can access on South Mountain. Holbert is a 4 mile out and back hike with an elevation gain of approximately 1,000 feet. This hike is rated hard but I would encourage you to give it a try even if you typically stick with the easy and moderate levels. I saw numerous families and puppies who were owning this trail! The elevation gain feels very gradual as you make your way to the top. The terrain is rocky but you never have to use all fours to get through the rocks. There is a lot of loose gravel so proper hiking shoes are a must. I am obsessed with my new Merrell kicks. You can shop them here. They’re on MAJOR SALE! 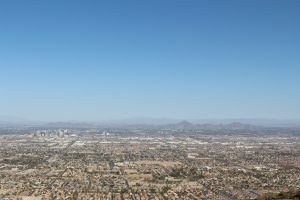 I have not spent a whole lot of time on South Mountain and I enjoyed seeing the city of Phoenix from this point of view! When you get to the top and arrive at Dobbins lookout, be sure to check out the structure and snap some pics. My friend Hailey and I sat on a bench to take in the view, eat some snacks and bond with the local squirrel friends. What I love most about Dobbins lookout is even people with limited mobility can access it. You can skip the hike and simply drive up! 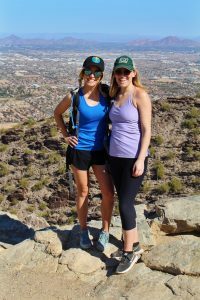 I live with a bladder disease called Interstitial Cystitis and for years a hike like this was physically impossible for me. I love when I get to post about a fantastic viewpoint that is accessible to everyone! No one should have to miss out on this scenery. Hours: 5 a.m. to 7 p.m.